One of the biggest factors affecting the taste of your coffee is the level to which the beans are roasted. Green coffee beans have very little flavor until they are subjected to the heat of the roasting process. The roast level that you prefer is largely subjective; however, there are distinct regional preferences. For example, individuals living on the West Coast tend to opt for dark roasts while those living on the East Coast favor light to medium roasts. 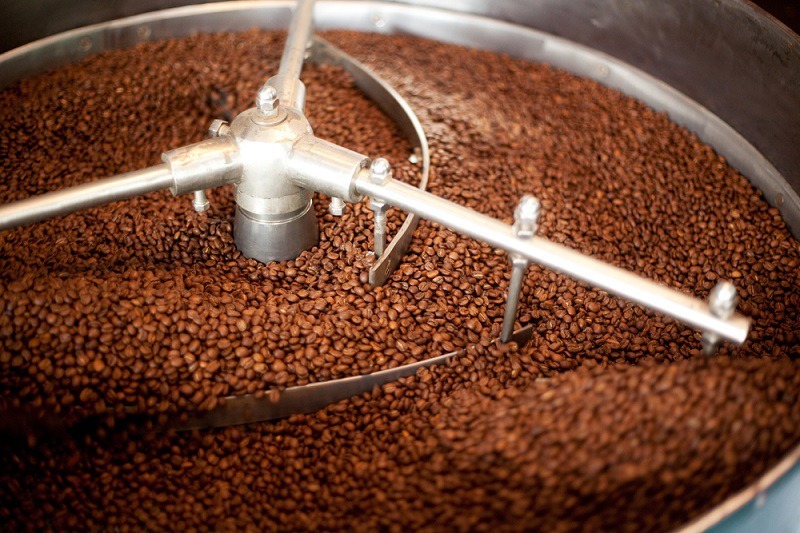 The roasting process is what gives the beans the flavor and aroma that we crave in a cup of coffee. When the beans reach the appropriate roasting level, they are cooled to stop the cooking process. After being allowed to rest for a couple of days, the beans should be used as soon as possible to ensure the best flavor. Expert coffee roasters often spend years perfecting their craft since achieving the optimal roast level requires split-second timing. 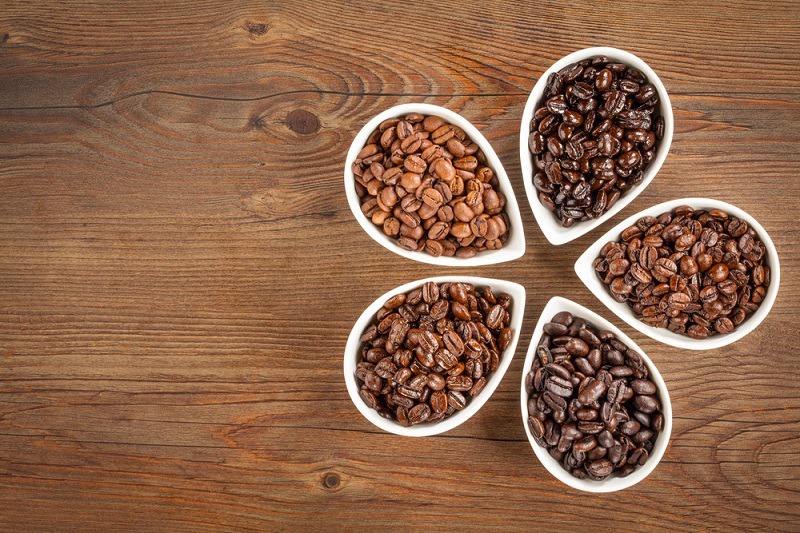 What is the Difference Between Light, Medium, and Dark-Roast Coffee? Does Light Roast Have More Caffeine? Which Roast Level Should I Use for Espresso? 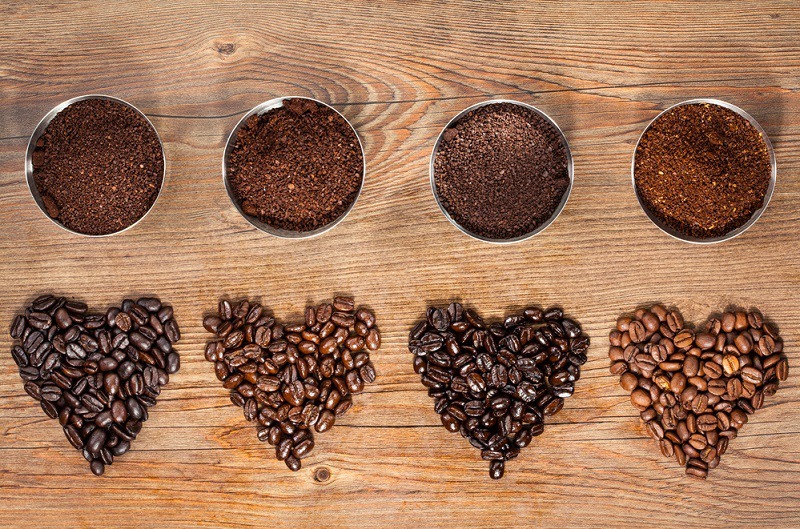 Coffee roasts are typically identified as light, medium, or dark according to the appearance of the beans; however, there is a whole range of roast levels within each category. The terminology used to identify the different roasts can also vary from roasterie to roasterie. • Light roasts can also be referred to as Half City, Light City, Cinnamon, or New England roasts. The beans are roasted to an internal temperature of 356°F to 401°F. The result is a bean with a tan to light-brown color and no visible oil on the surface. • Medium-roast coffees include American, City, Regular, and Breakfast roasts. The beans are roasted to 410°F to 428°F, which gives them a darker, richer appearance than light-roasted beans. The beans may also have a slightly oily appearance. • Full-City, Vienna, French, Italian, and Espresso roasts are examples of dark-roast coffees. The beans are roasted to around 464°F. They have a dark-brown appearance similar to chocolate and an oily sheen. Many roasteries will put beans that need to be used quickly into their dark roasts to use them up since you get very little flavor of the actual coffee. Dark and light roasts represent the extremes of the roasting spectrum. • Light-roasting preserves much of the original flavor of the coffee. This allows you to taste the subtle differences between coffees from different regions of the world. The flavor tends to be bright, fruity, and acidic, which can be off-putting for some coffee drinkers. • Dark roasts retain little of the coffee’s natural qualities. The predominant flavors come from the roasting process. Dark coffee is full-bodied with a smoky, bitter taste. Dark roasts stand up well to lots of cream and sugar. • A medium-roast coffee has a rich flavor but does not taste as burnt or tarry as a dark roast. The original brightness of the coffee is complemented by the roasting process. • Medium-roast coffee is the most popular among coffee drinkers in the United States while dark-roast coffees are favored among Europeans. • Light-roast coffee has distinct citrus and berry notes and is very acidic. This can make it too extreme for some coffee drinkers. • Medium-roast coffee offers a smooth, balanced flavor profile that is a compromise between the more extreme roasts. The roasting process decreases the caffeine level of the coffee. Light-roast coffee beans retain much of the original caffeine content of the bean while dark-roast coffee has less caffeine. Beans that have been fully caramelized by roasting to a dark level typically work best for a high-pressure espresso extraction. French, Vienna, Italian, and Full-City roasts all work well for espresso. Which roasting level is best comes down to personal preference. If you want to explore the characteristics of coffee from various regions, consider a light roast. If you like full-bodied coffee that would make a cowboy proud, go for the dark roast. If you just want a flavorful, well-balanced cup of coffee, opt for a medium roast. You can also experiment with trying different roasts at different times of the day. A bright, citrusy light roast is perfect for getting your morning started. You also get the benefit of the additional boost of caffeine. The bitterness of a dark roast pairs well with sweet desserts. You should also keep in mind that roasting is just one part of the equation that determines the taste of your coffee. The age of the beans, the level of the grind, and the method of preparation all influence the flavor of your coffee. Similar beans grown in different environments can also taste quite different even when roasted to the same level.